Although it’s sometimes hard to believe, there are homes in our community without a working furnace to provide heat throughout Lincoln’s harsh winter weather. As a heating and cooling contractor Bryant Lincoln has become aware of the need, and in 2010 we decided to use our skills and resources in an effort to make a difference. 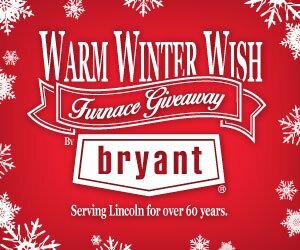 Every year since Bryant Lincoln has installed at least two, sometimes three, furnaces in homes in need. With the help of our distributor Comfort Products, these new high efficiency furnaces were installed free of charge. This year will be Bryant Lincoln’s fifth year helps those in need of heating assistance. Every story is special and amazing what families have done to make ends meet. From families facing unexpected major medical expenses to those living multiple years without a working furnace. Read more about each story. Few homeowners are prepared for their furnace to brake down, however many are able to pay to have it fixed or replaced. For others, a poor working furnace can be a hardship, perhaps there is a lack of money, health complications and other devastating circumstances. Lincoln is large enough that many stories of those in need go unheard. This is why Bryant Lincoln has teamed up with local radio stations Froggy 98.1 and WOW 105.3 to reach out to the community for help finding well deserving people in need.